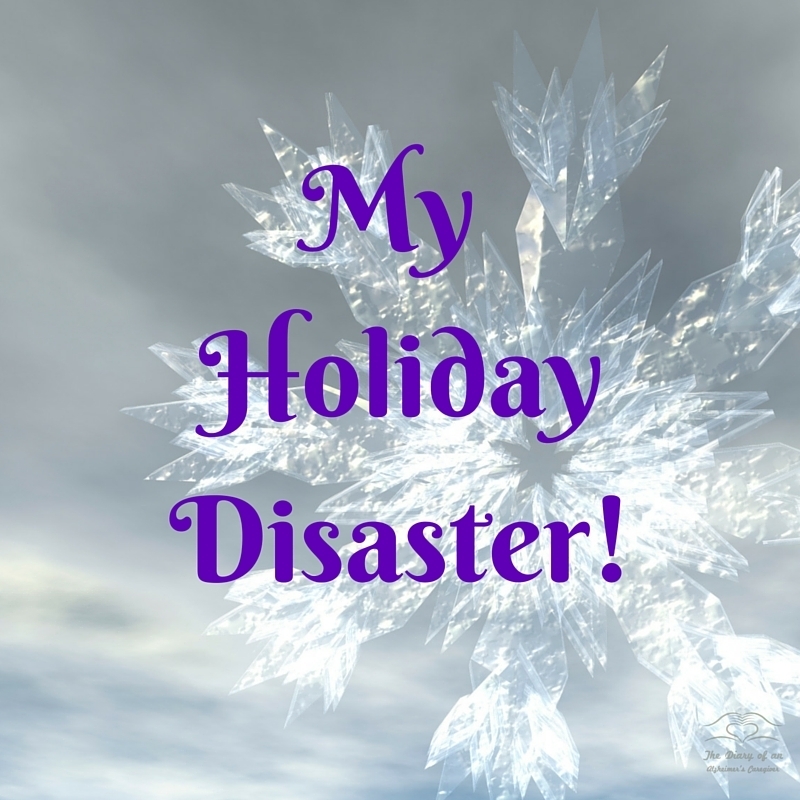 Home » Blog » OUR LIFE » MY HOLIDAY DISASTER! Who knew that one dinner would set into motion the wheels that would change my life forever. That dinner is where my old life ended and my new life began. I got choked! Yes, that was my life-changing, A-ha moment. A boneless, buffalo chicken wing would end up changing my life forever! I know it sounds stupid even to my own ears (and eyes)! That is what happened though. I got choked so bad that I literally shredded my vocal chords. I immediately lost my voice and it would not return for many, many weeks later. Those tears got so infected that soon I had a raging infection because of my non-existent immune system. I spent that whole week in bed sick. Talk about KARMA! My niece went home and mom returned and I remained sick. I woke up early in the morning of Jan. 3rd and couldn’t breath. The infection had gotten so bad in my throat that it was swelling shut. I was rushed to the ER at 4 a.m. where I would spend the next 5 days. This would begin the series of steps it took to become a knowledgeable caregiver and the birth of this blog. At this point, in time things were awful. I had fallen into a deep, dark and stinky hole of depression that I thought would never end. I thought of my life as over. I was stuck living this horrible day in and day out frustration, aggravation for the rest of my life. All the plans my husband had made were out the window. This would always be my life and that was a thought I just couldn’t stand to think about. Me constantly telling mom what she was forgetting, what she was doing wrong and how to do it right. As I am reading this I realize it was probably just as bad for her. Our lives were a mess, no rhyme or reason to it. How we had survived up until this point I don’t understand. Remember to Appreciate the good, laugh at the crazy and deal with the rest. Stay tuned to part 7. That’s sounds like such an ordeal! I’m glad that things started looking up after that! Eventually Roshni things got alot better. This chapter in your life sounds like such a nightmare. As much as I want to hear the story, I have to admit that it’s pretty painful. I like hearing it knowing that your life is in a much better place now. Thanks Susan! I love what Julie did with it! She does awesome work. I am going to write the last of the series in the next couple of days. It gets alot worse before it gets better but it does get better that’s the main thing! It is karen. I still have days, the nightmare from last week took me about a week to get over but a new week and a new outlook. Look onward not backward as I like to say. It was painful, the painful part hasn’t been told yet but it will…stay tuned. You are doing such a service to other caregivers by telling your story honestly. Wow, isn’t it odd how it can take this kind of crisis to put everything into proper perspective? Thanks for sharing it! Thank you Karen. Things can change in seconds Appreciate the good! Oh, my friend, how horrifying! Why do we have to reach the depths before we start to rise? I’m so glad you found the strength to carry on. Can’t wait for part 7! I have been putting these last few off until tomorrow, just the writing (editing) for Monday. I have had a pretty good week and tomorrow is my daughter’s birthday. A lucky day for me so good thoughts! Oh my what an ordeal for you over lousy chicken wings! Your caregiver stories always touch my heart. Thank you Haralee! It’s alot cheaper than therapy I have to admit. I want this to be something I can be proud of! That she would be proud of. Oh my goodness, what a horrible experience! It is so interesting how our lives can change so much when we least expect it. P.S. I’m so excited that you knew where I was vacationing! This town is so wonderful, and I will send you the rental information when I get home. Now I am super excited! I am planning a trip out there next summer. I revealed a surprise the other day but your on vacation so I was waiting to hit you with it when you get back! Yes, another damn website I must be crazy. I just need one to have a happy ending! Explain more later, go…have fun…think of my prize just kidding about that! wait a minute what are you doing commenting and reading on vacation!!!! I just realized that duh! Late night here getting some work done.